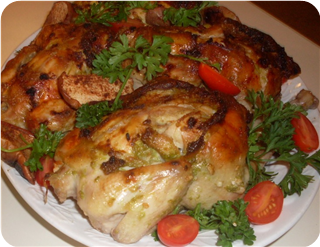 These hens are great served with fall veggies and baked apples. Position a rack in the lower third of the oven and preheat to 400 degrees F.
Make the pumpkin seed pesto: Heat 3 tablespoons olive oil, the pepitas, 1/2 teaspoon salt and a large pinch of paprika in a large skillet over medium heat. Cook, shaking the skillet, until the seeds begin popping and some turn brown, about 5 minutes. Remove from the heat and let cool completely. Transfer the seeds and oil to a food processor; add 1/2 cup water, the parsley, scallions, lemon juice and 1/4 teaspoon salt and pulse until pureed. Remove about 3 tablespoons of the pesto for the hens and set aside the rest for serving.